« Next Article: don Quijote on YouTube: Meet our students! » Previous Article: Poll Results: Most Spanish Teaching visitors are learning Spanish - For the sheer pleasure of it! Blogging Spanish is our new blog of Spanish language. A blog for students, teachers and for anyone interested in Spanish language and culture. In Blogging Spanish we will offer you the latest news about don Quijote, the world's leading institution for Spanish in-country courses. 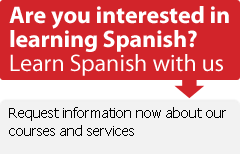 You will find the best offers for your Spanish course abroad, news about Spanish language, useful resources and information about Spanish-speaking countries and cultures. A new star is born, go to blog.donquijote.org and visit our new blog. We want to hear what you think, please leave us your comments.